Such strange light mid-morning today. Very bright sun in a cloudless sky, yet also somehow very “gauzy.” It’s not hazy today, nor is it humid or even slightly overcast, so the gauzy quality makes no sense. But you can see how soft some of the shadows are. Even if they are thrown down by more faraway trees, those trees aren’t so distant that I’d expect such faint shadows. Actually, I think I just figured it out, but sadly it’s now almost 1:00 pm, so there’s no chance to check my theory out. I’m guessing that the fainter shadows are the result of sunlight reflecting off the glass of the Grohmann Museum’s atrium and then casting shadows of those branches from a different angle and with a weaker light. I suppose that might also explain the strangely gauzy quality of sunlight, as well. 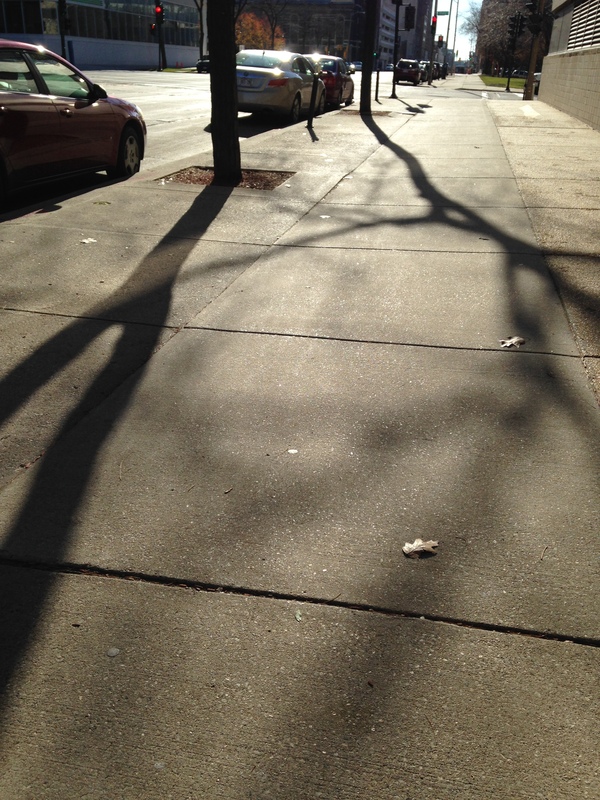 This entry was posted in Life, Milwaukee, Nature, Photography and tagged quality of light, tree shadows. Bookmark the permalink. Not a bad theory. I wonder if light, as does sound, cancels itself out if coming from two different sources. When designing an auditorium placement of the speakers is important or one might create a dead spot where there is no sound (or almost no sound). Light travels faster than sound and the waves are much shorter so…? If two identical light sources were shot directly into each other, I would think, that would they pass right through each other or at least look like they did to the naked eye. “If you want light waves to continuously cancel, you have to get them moving together in the same direction and [180 degrees] out of phase,” says Robert Reiland, over 40 years of teaching introductory physics. That’s so that one wave is riding up while the other is riding down. BUT…if light waves come at an angle rather than straight at each other, there will be a little distortion (maybe) when the light reaches the eye (we can’t ignore that step). It’s possible that the brighter light gets to the eye first and that the lesser light acts as distortion. Or maybe not. You know they don’t know much about how this works adding the eye in (each person’s eye being a bit different). A lot of theory, but less mathematical proof. AND…there is also the idea that the sun is going through a lot more atmosphere from it’s position near the equator in winter than it is when it’s directly over head in summer….more atmosphere sometimes gives a rich light near sunset (like night before last), but more often the daylight in winter is washed out and dim. So that might be what you are experiencing at midday….23 days from the Winter Solstice. My two cents. Wow, that’s really mind bending to think about. Maybe that’s what was going on, because look at how one of the tree branch shadows seems to disappear at one point, as if an eraser had been rubbed through it. It’s like a light “shadow” cancelled out the darkness of the actual shadow. Oh hey, I just thought of something. Maybe it’s the same thing you’re talking about. In Michael Crichton’s Timeline (which is a really good book!) time travel and parallel universes are explained in terms of shining a flashlight in a dark room through a piece of cardboard through one slit, two slits, multiple slits. There are a few illustrations showing how the rays of light shining on the wall opposite the cardboard don’t match up with the number of slits. There are, weirdly, both more and less stripes of light, and the rays of light somehow either amplify themselves or cancel each other out. Is that what similar to what you’re talking about?